I found “The Disabled Workforce: What the ADA Never Anticipated” by Rachel Shaw to be a fascinating read. Before reading this, I didn’t know anything about the Americans with Disabilities Act (ADA) because my background is in education and training. As a non-HR professional, I have to admit that I feel now that I could have a decent conversation about the ADA, though there is still much more to learn. In fact, I’m actually interested in learning more about this law and how we can use it to help our people. The author begins by laying out a history of the ADA and then provides many examples as she first introduces a great resource she created called, ‘The Disability Interactive Process Hallway.’ Shaw moves you through the hallway, explaining how the ADA process works and how it is meant to help. Shaw uses this time to share numerous stories of employees who have had to go through the ADA process (with both good results and negative results). She even shares examples where it doesn’t seem right or fair for the company to have to go through the ADA process, but it is just. She shows how important it is to keep our companies compliant by following both the letter and spirit of the ADA. Through all of this, she continues to weave in the use of her Disability Interactive Process Hallway. Some of the topics discussed here are the history of the ADA, Title I, making reasonable accommodations, fitness for duty exams, managing mental disabilities, conflict between disability and discipline, worker’s compensation, Leave Management challenges, and pre-employment and post-offer medical examinations. 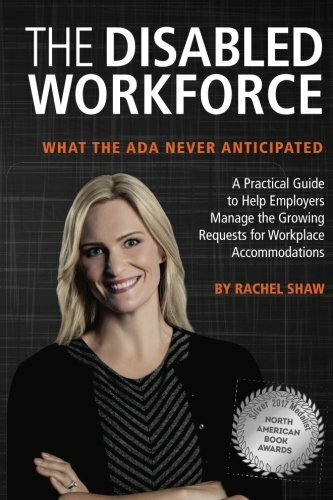 While “The Disabled Workforce” is aimed at HR representatives and leaders who have to help employees through the ADA, I recommend this book to both HR professionals who struggle with finding ways to comply with the ADA, and with organizational leaders who are interested in exactly what the ADA is and how it impacts them and their team. That said, keep in mind that “The Disabled Workforce” by Rachel Shaw is not an exciting book. It is, though, a practical book (that is well-written!) and should be read and reread. Furthermore, it seems like a book that should be kept on hand as a desk reference as well, whenever an employee needs to progress through the ADA process for any reason.